Back in 2012 a few industrious and rum loving folks had the wondrous idea to make a new rum and distill it right here in southwest Florida, Cape Coral to be exact. Utilizing Florida's very own sugar cane crops and other locally sourced ingredients, all of their rum is small batch, handcrafted using an American copper still pot. Rums are then placed into American Kentucky whiskey barrels and aged anywhere from 3 to 14 years. 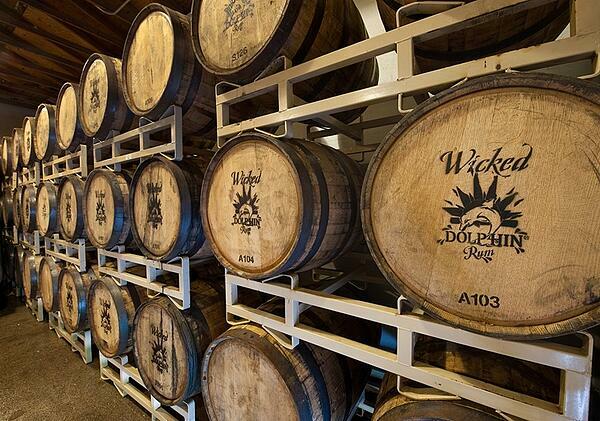 Wicked Dolphin is the largest craft rum distiller in Florida and perhaps in the United States. One of the most unique rums that has ever been made, were thought up by these creative individuals. Imagine taking your prized, distilled beverage and submersing it on a sunken World War II Navy ship? Well, that's exactly what Wicked Dolphin did. See the video below for more. This family run business produces award winning rum's which include gold medals from the International Rum Competition in Madrid. If you are the curious type and have a taste for fine rum, everyone is welcome to see just how they do their magic during distillery tours on Tuesday, Thursday and Saturdays. After the tour, enjoy "Wicked" samplings from the tasting room before browsing through the gift shop where you may take home your favorite flavors, distillery souvenirs and delicious recipes.